If you have been following my wedding posts, or haven't seen the one labeled "Emily's Wedding," you need to check that one out to see the change in the chandeliers. For my niece Erin's wedding I collected lots of white paper lanterns. She had a big tent. It took forever to put each one up and take each one down. I made cardboard bottems for the lanterns and placed huge battery operated candles in them. For Emily's wedding, her mom and I decided to make chandeliers with boards, eye hooks, and wire. Our plan was to hang clusters of the paper lanterns from each one and hang a chandelier over each table. If you look carefully behind the parrot in this newest adaptation, Emily's dad decided to take coat hangers apart and weave the bottom through the top eye hooks. He said no one would notice the hanger and it would be so easy to put up and take down. It was. So, for the Margarita Luau office party tomorrow, I wanted mood lighting in the tent. It is set up right off of the office's huge kitchen/party room, so I didn't need a light package. It just might be the first Margarita Party in 24 years where it won't rain. I have gotten home from the hospital just since Sunday. I am supposed to be resting, but with 300 guests coming tomorrow, I couldn't relax like I am supposed to be doing. Instead I took the jars with candles that we had made for Erin's wedding. I hung five of them from different heights. Last year's parrots have found a new perch. 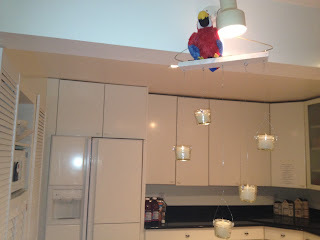 He's only hanging temporarily from my kitchen light fixture. He and his two friends won't be moved until the tent goes up. I love reinventing props I've used for other parties. My daughter, the photographer, is taking lots of pictures with everything set up. I will post them when I've recouped. Fortunately, some of these props will work with the sit- down baby shower for 25 I'm having here a week from Saturday. Yes, the bathtub overflow that leaked into my dining room ceiling has been fixed and the ceiling is repaired and painted. My friends and family have really pulled through to help with this party. If you are reading this, here is a big THANK YOU.